Certifications | De Molli Giancarlo Industrie S.p.a.De Molli Giancarlo Industrie S.p.a. The Company has obtained the ISO 14001:2015 | READ OR DOWNLOAD THE CERTIFICATION. 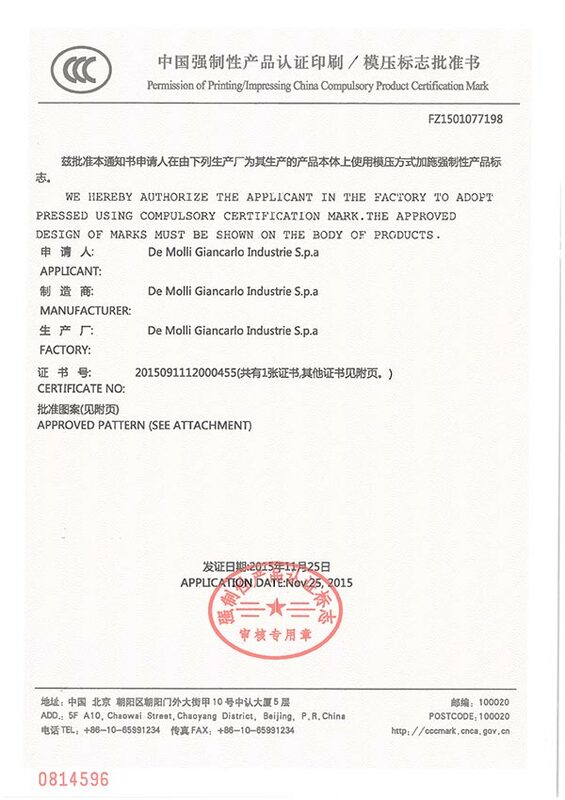 The Company has obtained the CCC (China Compulsory Certification) mark | READ OR DOWNLOAD THE CERTIFICATION. The Company has obtained Enel and Terna rating for medium, high and extra high voltage equipment and terminal box and the rating from Ferrovie dello Stato (Italian State Railways) for equipment and terminal block for Primary Lines. The Company has obtained the qualification as an ENEL and Terna official supplier, other European Electric Authority and major national installers of overhead power lines. Our need to be professionals in every area of ​​our production has led us to specialize our technicians in various fields, through specific courses for welding and non-destructive testing. Our philosophy of “continuous improvement” to all manufacturing processes has allowed us to get all the most important quality certifications. The property and the craftsmen work daily towards a common goal: safety. Professionals and consultants also take regular educational and awareness class in full compliance with in force law.